Cover is worn and starting to separate from text block. Name written at top of first page. Inside pages are clean. 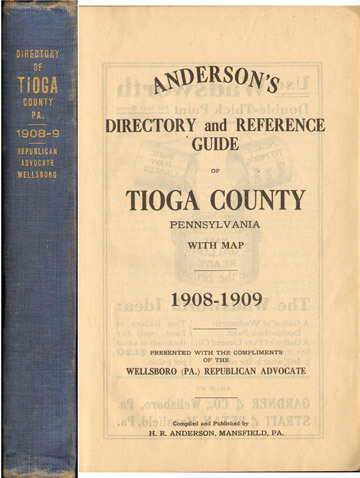 Map of Tioga County mentioned on title page is present but does have some seam separations and gaps. Tens of thousands of listings of residents from across Tioga County, Pennsylvania. Listings include the name of the spouse, occupation, and address. Includes the communities of Wellsboro, Mansfield, Blossburg, Elkland and numerous smaller locations. Also includes ads from numerous local businesses. This book does not include family biographies. The book described above is priced at $29.95 plus $1.95 shipping. If you wish to pay by credit card, please use the shopping cart below (checkout goes to a secure server.) Credit card orders may also be placed by phone to Hearthstone Legacy Publications from 9 AM to 11 PM (Central Time Zone) Monday thru Saturday at 816-204-7593.